Awesome bedroom or separate playroom either way if you have the space that your little one can call their own is a great step towards their independence. My son has a nice little room but things are always pulled out into the main space. For the most part, it is life as we know it when all the living areas are on the same floor. His room is a bit small which is half the problem. As he is growing, the want for constant supervision from a baby to toddler is making way to preschool independent play. Bright room brighten minds! Well I like the sound of it anyway. 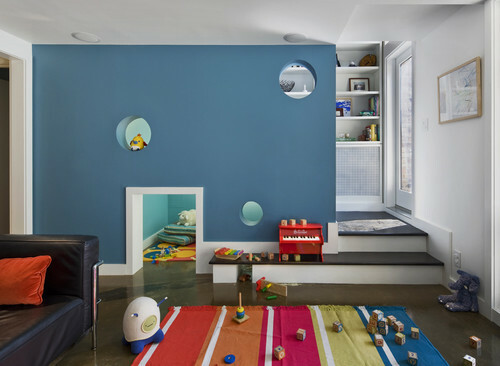 Quirky layouts, hide-away spaces and peek holes are always a delight. As great as a space may look, it must have storage, whether it is built-in, stacked baskets monochromatic or colour coordinated, it is a necessity. There is a place for mess! Who wants to knock down the “perfect” tower, racetrack or fort every day. The photo above has a loft which is a perfect area for creating and keeping masterpieces for a few more days. The loft also doubles as a sleepover area for guests. 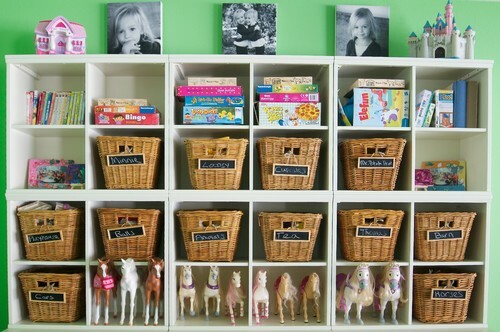 Open shelving can be daunting, but by adding baskets, or grouping smaller containers can minimize the mess. Still not for you? Add a few doors to keep things out of sight. 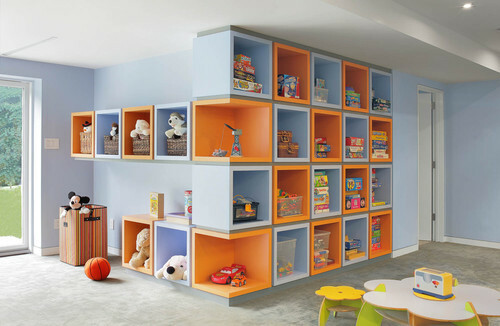 Let your kids input help guide your space. Be realistic about how you will treat the space, a new space will not “make” everyone tidy over night. 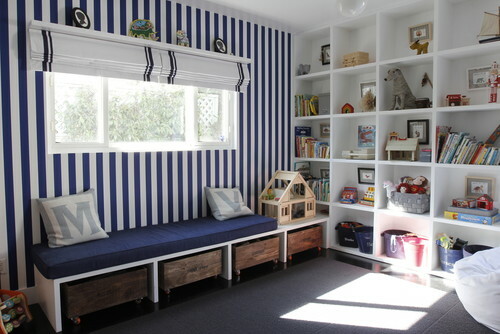 If you are a “everything has its place” minded family, open shelving would go down a treat. If you are more ” I clean up after my kids and have very little time at the end of the day” minded family, then think about bigger “dumping” or pull-out bins. Everything is at their finger tips and it is really quick to put things away at the end of the day. It is even easy for the children to help. Most of us land somewhere in between. Assorting collectibles in appropriated sized bins, some open and some closed shelving and also larger baskets for your children’s most used toys. Mix and match and see what works best for you. Transitional Living Room by Vancouver Interior Designers & Decorators Enviable Designs Inc.
You just can’t stop the toy migration…but good storage solutions at least reduces the clean-up frustration. Categories: Bedroom, kids | Tags: children, colour, kids, loft, play area, shelving, storage, storage bins, toy chest | Permalink. Whether your quandary is with a small guest room, child’s room or master bedroom the resultant frustration of “what on earth do I do with it?” is the same. An appropriate size bed for the size of room is one thing, but sometimes when space is premium, we run out of options. So the next best thing is to be creative with storage, add some quirkiness and work some design tried and tested methods. This bed just fits and no more in this guest room. For a night stand, shelving on the back wall provides just enough space for a glass of water for your temporary guests. 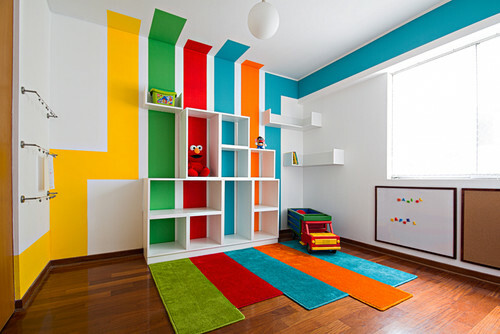 Kids bedrooms are always so fun for creative space solutions. Whether it is using beneath the bed with drawers for toys or linens or cubbies for books right by the bedside. Find places for pin boards, display areas where you’d least expect it, and (in the case of the image of the above left) a port-hole shared between sibling rooms. The over sized map is a great visual interest for re-directing your attention. It helps give the impression of a wider space, which is also aided by the curve-linear design of the rug on the floor. 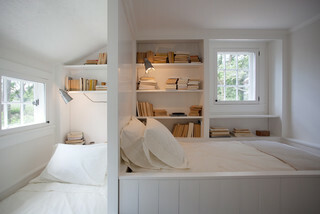 The image on the right, uses a simple white scheme to make the space seem more airy, but as with many schemes the clutter (and colour) is kept to a minimum. The fun and little hidey spaces aren’t just for the kiddies. When there isn’t enough floor space for night table or a chest of drawers, build up! 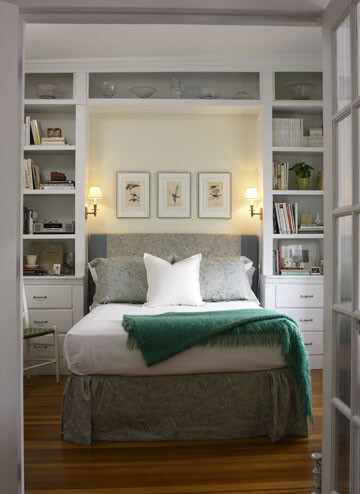 The built-ins around the bed, not only add storage but add a great deal of character and interest as well. The spaces seem to look more finished. There is space for ornaments, books, and personal belongings. An alcove around the bed is the perfect opportunity for mounting wall sconces and an interesting headboard…a little niche. I adore this space. It is fun and playful. If it would have gone down a traditional route of bed-night stand etc. it probably would have folded in on itself. The over all black and white scheme has interesting elements “dotted” throughout. This not only a pun on the upholstery pins that create an upscale interest on the basic white shelves, but also to the creativity within this tiny space. The placement of the shelving creates a bedside surface at the window and another for a workspace at the foot of the bed. Even the quirky “Apocalypse Now” quote on the roller blind adds to the rooms interest. The coloured ceiling and mock black posts and rails around the bed space makes me think of a four poster bed! So much artfully placed creativity leads you to pause and to take in the elements of the space and not its size. The successful outcome of the small space is only limited by your imagination. It almost forces you to become more creative with your spatial solutions. 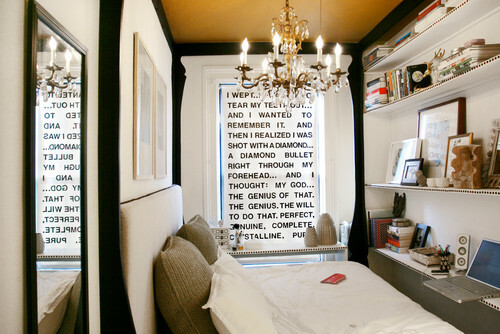 You’d be surprised that it may end up being the best room in the house! Categories: Bedroom | Tags: bed, kids, master bedroom. playful, shelving, small, storage | Permalink.